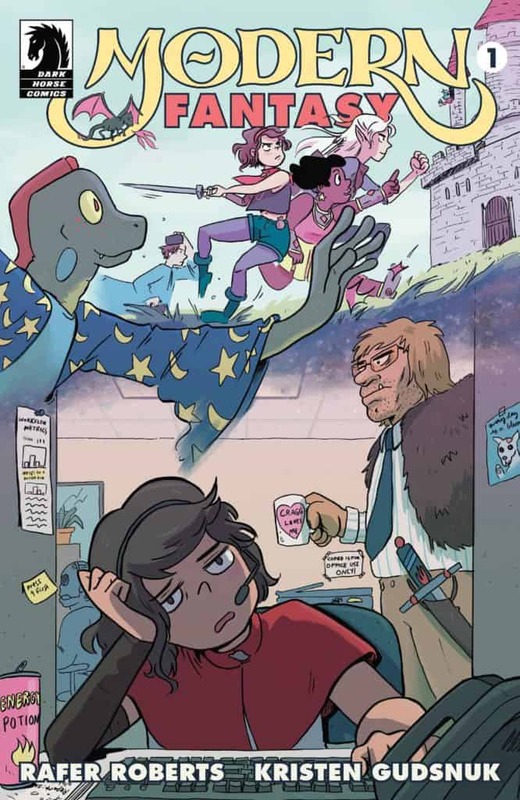 Magic Meets the Modern World in a Hilarious New Series from Kristen Gudsnuk and Rafer Roberts! It’s a fantasy adventure coupled with the comical monotony and vicissitudes of life and it’s coming to Dark Horse Comics this June! 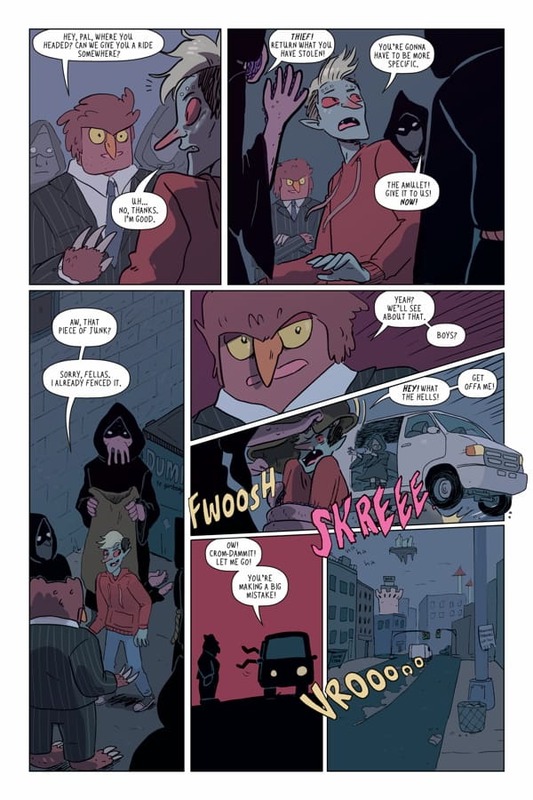 After releasing HENCHGIRL with the publisher last year, creator Kristen Gudsnuk returns with a new project and she’s teamed up with writer Rafer Roberts (A&A: THE ADVENTURES OF ARCHER & ARMSTRONG), making his debut at DHC! So sit back, relax, check out the preview, and learn more about this new Dark Horse series as I chat with both Rafer and Kristen discussing this exciting D&D-inspired fantasy collaboration of theirs and the epic adventure that awaits! A young Ranger woman who came to the city with dreams of adventure, her drug-dealing reptilian wizard roommate, and her boisterous Dwarf maiden BFF embark on a modern-day quest to save the world while struggling to keep their crappy day jobs and pay off their student loans. The roommates become embroiled in danger when one of their significant others finds himself taken by criminals, and the trio must get their $#!& together to save him. PopCultHQ: How did the two of you come together to collaborate on MODERN FANTASY? 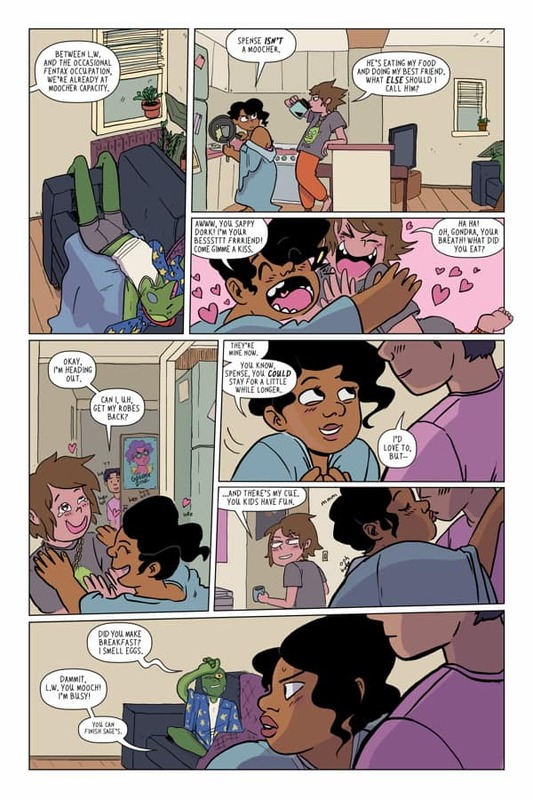 Rafer Roberts: I was crashing at Justin Jordan’s table at a New York Comic Con a few years ago when Kristen dropped off an issue of Henchgirl, looking for collaborators. I immediately became a fan. I remember that we hit it off right away, talking about comics, and I got super into the possibility of working on something together. I forgot to follow up for like a year, but luckily Kristen was still free and still game to work together. I didn’t have anything in mind, but Kristen mentioned something about wanting to do something with magic in it which got me wondering what the world today would be like if every fantasy novel or role-playing module really was our actual history, and the rest of Modern Fantasy sprung out from there. Kristen Gudsnuk: Rafer and I met long ago at New York Comic Con. We mentioned working on a series together– I wanted to try a collaboration, versus my usual “do it all myself” approach. It was pretty clear from the get-go that we’re on the same page creatively, and we both love each other’s work! I think I mentioned a love of magic (and humor) when we first met, which helped inspire the concept. Rafer reached out to me about developing the pitch, and when we started working on the kernel of Modern Fantasy, things just really gelled. PopCultHQ: Rafer, your run on Valiant’s A&A: THE ADVENTURES OF ARCHER & ARMSTRONG immediately caught my attention, as it had me literally laughing out loud numerous times throughout each issue. 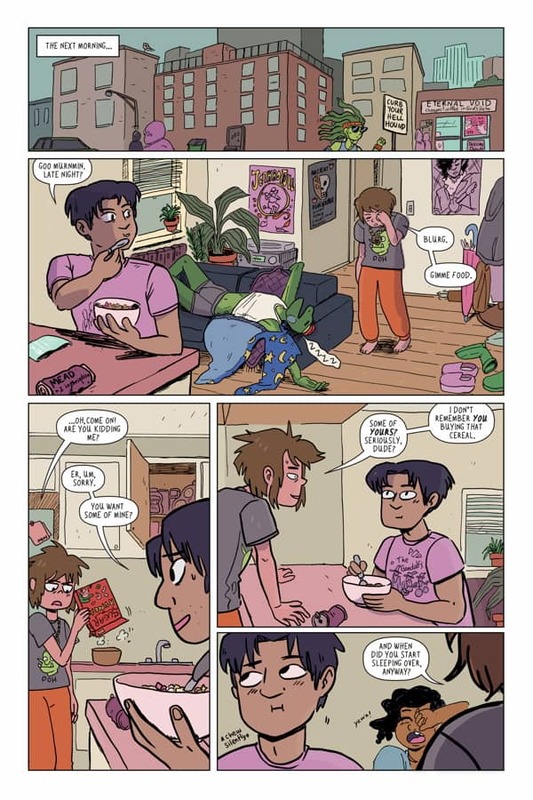 With MODERN FANTASY, you get to bring your comedic wit back through some of the everyday struggles young adults deal with (work issues, roommates, commuting, awkward social situations, etc.) even experienced in this fantasy world. Do you find it easier or more difficult writing a light-hearted, humor-infused miniseries than an ongoing with a tone the likes of 4001 A.D., HARBINGER RENEGADE, or RAI: THE HISTORY OF THE VALIANT UNIVERSE? Rafer Roberts: Both stories have their unique challenges, but I think that writing comedy is more in my wheelhouse. It feels more natural, and to be honest, I feel better at the end of the day. Grim and serious drama tend to wear on me more heavily. I actually started working on Modern Fantasy right as I was finishing up the Massacre arc in Harbinger, which was pretty dark and my mind had to go to some dark places to write it. Being able to balance the darkness with something more light-hearted and funny really helped me out. Plus, with Kristen, I’m working with someone who also knows comedic timing and how to sell jokes. So, if one of my jokes isn’t landing (which happens) Kristen is right there with a fix. 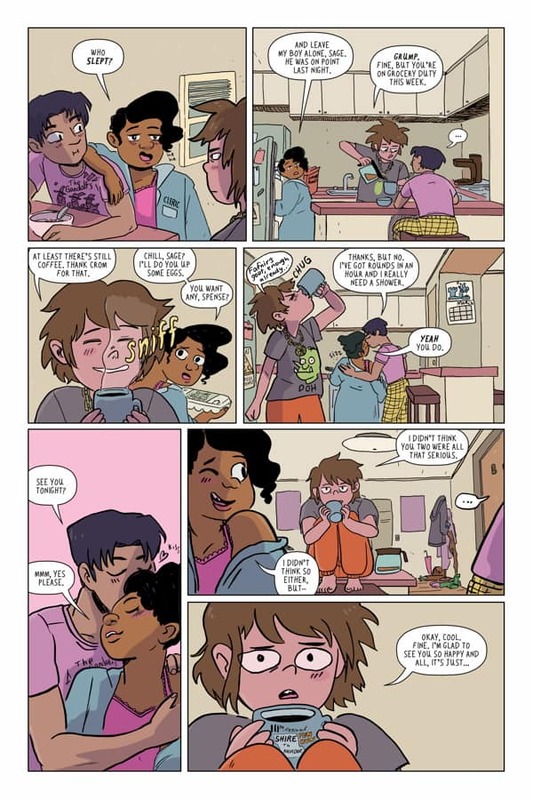 PopCultHQ: Kristen, your illustrations make for an ideal look for MODERN FANTASY and from my advance look at issue one, it seems like you’re having a lot of fun drawing it. What do you enjoy most about illustrating MODERN FANTASY? And from where did you come up with some of the creatures? 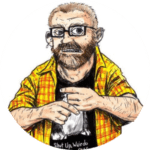 Kristen Gudsnuk: Rafer’s script was full of hilarious ideas for the background creatures– stuff like a griffin clipping its talons on the bus– and I threw in some gags of my own. This is where having a writer comes in handy! I do have a lot of fun with the character designs here because the world is so outlandish. A lot of the time I just doodle from my imagination and let the designs come out organically. Sometimes you get really interesting stuff by going that route, rather than sticking faithfully to a preconceived design. PopCultHQ: MODERN FANTASY features numerous role-playing nods and spectacular fantasy elements. Did either fantasy or RPGs (or both) play a role in either of your lives? Kristen Gudsnuk: I never really played role-playing games, but I was always a big fantasy nerd as a kid. I loved Tamora Pierce and Mercedes Lackey, and I’d read any and every fantasy book at the library. Also, my sister and I both went through an intense Lord of the Rings phase– we even made a parody film (starring our little brother, who was 7 or so at the time, as a hobbit) called Lord of the Rungs. A lazy pun, but thankfully, years later, being a Hobbithead is finally paying off. Some of my best high school memories were of playing D&D (2nd edition) in my friend Scott’s basement. I remember we’d run these full 48-hour sessions over a weekend or longer on holidays. I don’t remember much about the campaigns themselves, but I do remember some of the more epic arguments and people storming out. We pretty much destroyed Scott’s house throwing glasses or smashing plates against the wall when disputes got really heated. There was always a good chance a session would end with a trip to the ER. I wonder if that’s why I stopped playing. I never could find another group as destructive as that one. 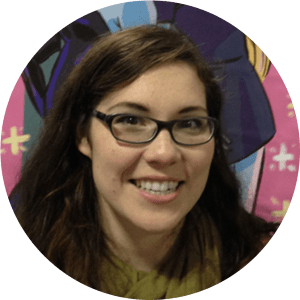 PopCultHQ: Kristen, what do you love the most about what Rafer brings to MODERN FANTASY? Kristen Gudsnuk: Rafer’s writing is really top-notch, and it goes to really funny, character-driven places. And it’s been so interesting, as a writer, to see how to structure a story from the inside out properly. 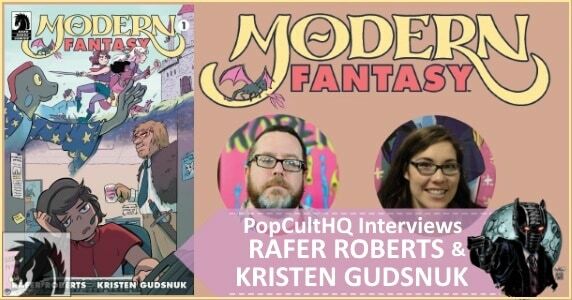 PopCultHQ: Rafer, same question, what do you love the most about what Kristen brings to MODERN FANTASY? 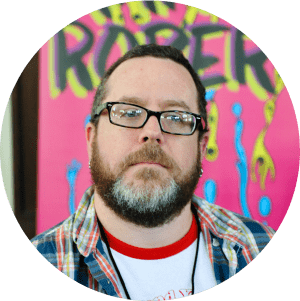 Rafer Roberts: I think this is the first time I’ve worked as a writer with another writer/artist, and I’m having a blast. Kristen keeps coming up with good ideas for background gags, character moments, and pacing. I look back on the completed issues and can’t tell who came up with what sometimes. It really is a true collaboration. And, as I mentioned earlier, Kristen has a really good sense of timing, both in action and comedy, which is incredibly difficult. Her character and creature designs are wonderful and hilarious, and her willingness to experiment pushes me to step up my game. PopCultHQ: Are any elements in the miniseries based off actual events or stories from your life? Rafer Roberts: Not anything specific, but maybe more in a general way. I’ve worked a lot of different jobs in my life, and most of them sucked. I’m sure that influenced how each of the characters deals with their own career paths, but then again, I don’t see my experience with crappy jobs to be unique in any way. Like Sage, I’m sure most people have labored through soul-crushing desk jobs, mindlessly entering meaningless data while their barbarian coworker blathers on about the upcoming Feast of Cragg holiday, or their beholder boss writes them up for getting on Facebook during office hours. 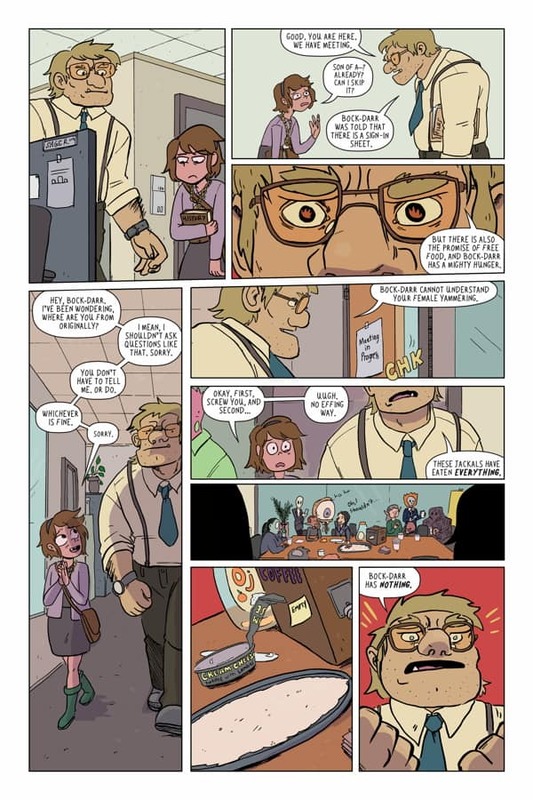 Kristen Gudsnuk: I definitely drew from my experiences after college as an underpaid temp when drawing our Ranger heroine Sage’s crappy office job. I related very much to her! PopCultHQ: If you could pitch the debut issue, and why MODERN FANTASY #1 can’t be missed, what would you say? Kristen Gudsnuk: Sage is a Ranger who slogs through an office job, dreaming of a good adventure. Until her friend’s annoying boyfriend gets kidnapped by a cult, and she gets pulled into a quest that quickly spirals out of control. Modern Fantasy is an adventure about mitigating your expectations from life! Rafer Roberts: If the cast of Broad City lived in a world that was sword and sorcery themed, and that they had to prevent the apocalypse while getting on with their day to day lives, that’s MODERN FANTASY. Special thanks to Rafer and Kristen for taking the time to speak with PopCultHQ. 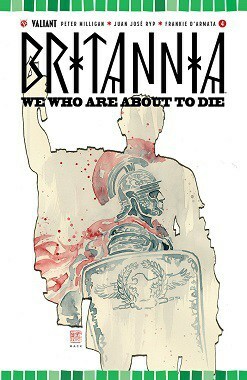 And an extra special nod to Megan Connor at Dark Horse for making it happen! Be sure to watch for MODERN FANTASY #1 when it releases on Wednesday, June 27th at your LCS and online retailers. 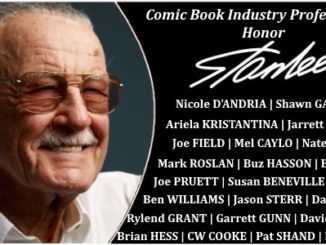 And be sure to follow Rafer Roberts, Kristen Gudsnuk, and Dark Horse Comics online for all the latest on MODERN FANTASY!